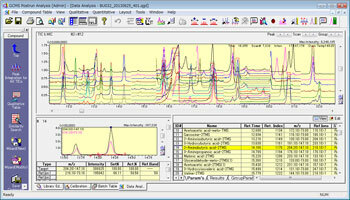 Database Software for GC/MS and GC-MS/MS Supporting Metabolite Measurement. This database mainly contains metabolites included in biological samples, such as serum, urine, and cells. The increased number enables accurate identication of more metabolites. Samples treated with metabolomics contain many metabolites and matrices. In some cases it is difficult to measure such compounds because the components overlap. However, MRM measurement, which performs mass separation twice, can eliminate this effect, enabling detection of components that cannot be detected with conventional scan and SIM measurements. The MRM mode also makes it possible to obtain more accurate quantitative information. GC conditions and optimal scan and MRM measurement parameters for each compound are preregistered in the methods. In addition, the database contains retention indices for predictive calculation of the retention time, which enables start of analysis even when a standard sample of a metabolite does not exist. By simply selecting the compound to be measured from among those registered in the database, the measurement method and data analysis method for Scan, SIM, MRM, and a combination of those modes can be automatically created. Obtain highly accurate identification of compounds using the retention indices and mass spectra. The library information is also listed in the handbook. 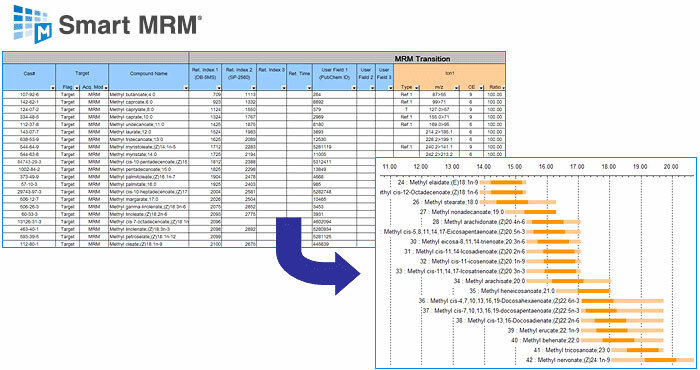 By performing MS separation twice, the MRM mode eliminates the effects of interfering components and enables accurate determination of the quantity. 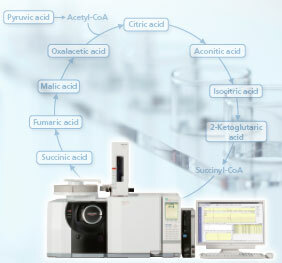 In addition, it allows for easier identication of compounds than the Scan or SIM modes. The database contains method les and mass spectral libraries (scan). The method files include analytical conditions appropriate for the registered compounds and the set data analysis parameters. The libraries include retention indices, CAS numbers, structural formulas, etc. It is possible to start measuring metabolites without laborious tasks such as investigating the analytical conditions or optimizing the parameters. Organic acids, fatty acids, amino acids, sugars, etc. *1: "TMS" indicates a trimethylsilyl derivative, and "Methylation" indicates a methyl ester derivative. *2: Method files and libraries of fatty acid methyl esterication include chemical ionization (CI) data as well as electrical ionization (EI) data. *3: EZ:faast™ is a product of Phenomenex Inc. The Smart MRM feature can be only used with GCMS-TQ8030. Be sure to test the qualitative and quantitative information obtained with this system using a standard sample for conrmation. To reliably identify substances registered with this database, perform measurement using the system requirements of the method template le included with the product. The links below will redirect you to our US website to read/download the Application Notes.